Charming movie producers comes naturally for Sylva. Its mountain vibe hits all the right notes. With its classy facades, vibrant streetscapes and small town charisma dressed up in sweeping vistas. For us, it’s just home. But for Hollywood, the North Carolina mountains of Jackson County are a captivating, real-life backdrop. Sylva is lighting up the silver screen once more in the critically-acclaimed Three Billboards Outside Ebbing, Missouri. Ahead of its November 2017 release, Three Billboards has already raked in the accolades, including the People’s Choice Award at the Toronto Film Festival and Best Screen Play at the Venice Film Festival. Transforming Sylva into the fictional town of Ebbing, Missouri, was easy work. Downtown Sylva’s authentic character makes it an instant movie set, and it only took a few imposed storefronts here and there from Ebbing to complete the picture. The original story line of this suspenseful, dark comedy follows a mother who takes on the law over her daughter’s unsolved murder. Three Billboards stars Woody Harrelson, Frances McDormand and Sam Rockwell with artful directing by Hollywood Veteran Martin McDonagh. 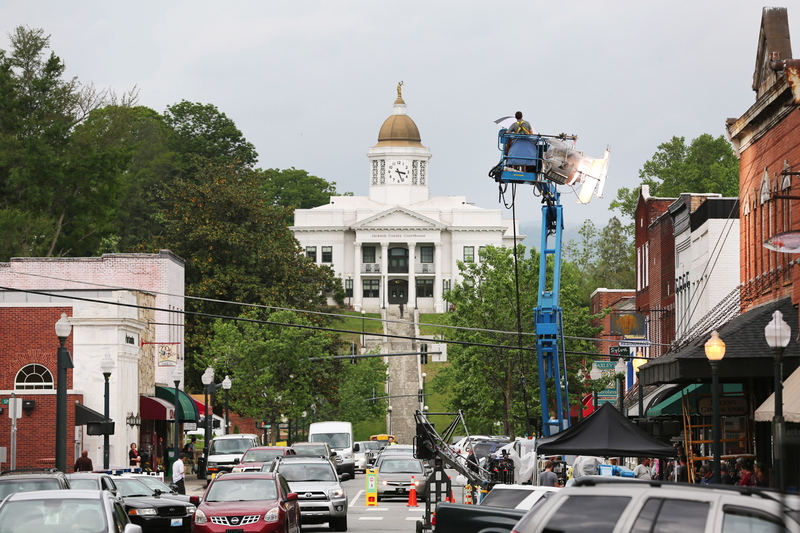 When film crews took over the streets of Sylva last spring, the whole town got into the festive spirit. The local Sylva Herald newspaper even put out an edition as the Ebbing Herald in jest after its building was remade as the fictional Ebbing Herald by set designers. “It was a very fun and exciting time for all of us,” says Tammy Fuller, owner of Sassy Frass boutique in downtown Sylva. 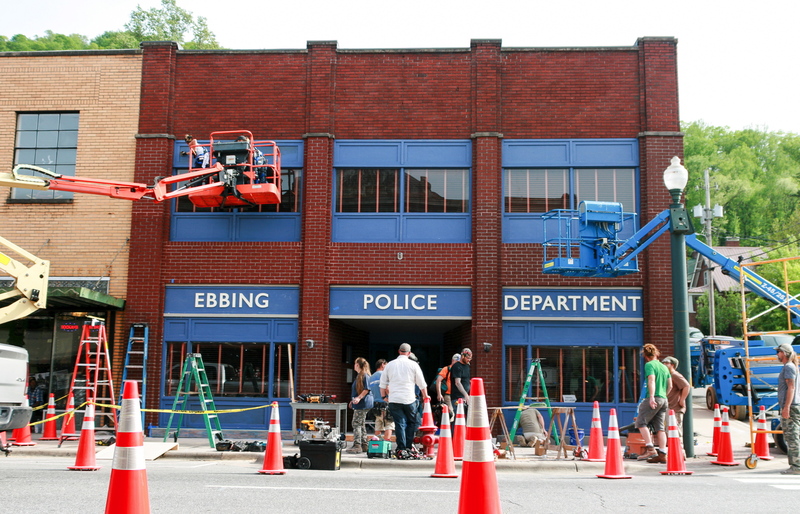 Fuller’s store had the honor of being transformed into the Ebbing Police Station, a main filming site. Incidentally, Sylva’s real police station is just two blocks down from its fictional counterpart. A few of Sylva’s finest even landed natural rolls as Ebbing police officers. They weren’t alone. Lots of locals walked on to the set as extras, so be on the lookout for familiar faces in the movie. When movie scouts first sleuthed out Sylva, it was one of 40 towns on the short list. So, what made Sylva stand out? “They loved the view of the mountains you get right from the heart of downtown Sylva. They definitely wanted that scenery,” Fuller says. But it was Sylva’s welcoming ambiance that tipped the scales. “I think it was because the community was really loving, very affirming and had a good feel,” Fuller says. Crowds gathered on street corners from morning ’til night during filming to catch a glimpse of the action. And the spectators were rewarded with plenty to see. Scenes included a man tumbling out a second-story window onto Main Street below and the bombing of the fictional Ebbing Police Station. Fuller admits that part had her a little nervous, but her store was put back good as new. “They did catch it on fire, but today if you walk in you could never ever tell,” says Fuller. In one heated scene, McDormand shouted colorful language not typically heard on the streets of Sylva, and that same free-wheeling language is what landed the film an R rating. Catching a glimpse of the stars during filming was commonplace, with actors reveling in the small-town spotlight. Woody Harrelson frequently swung past the crowds of street spectators to offer smiles, handshakes and autographs. A selfie with Harrelson was the gold standard, of course, and there were plenty of those to go around too. Harrelson even struck up a few guitar chords at the local music store next door to his fictional police station. Whether it’s kicking back at our open-air breweries, catching a flick at a movie-house cafe, or lounging by the creek for a Friday night concert, Sylva is a destination where even the rich and famous can be themselves. Plan a getaway to Jackson County and experience your own slice of movie magic. 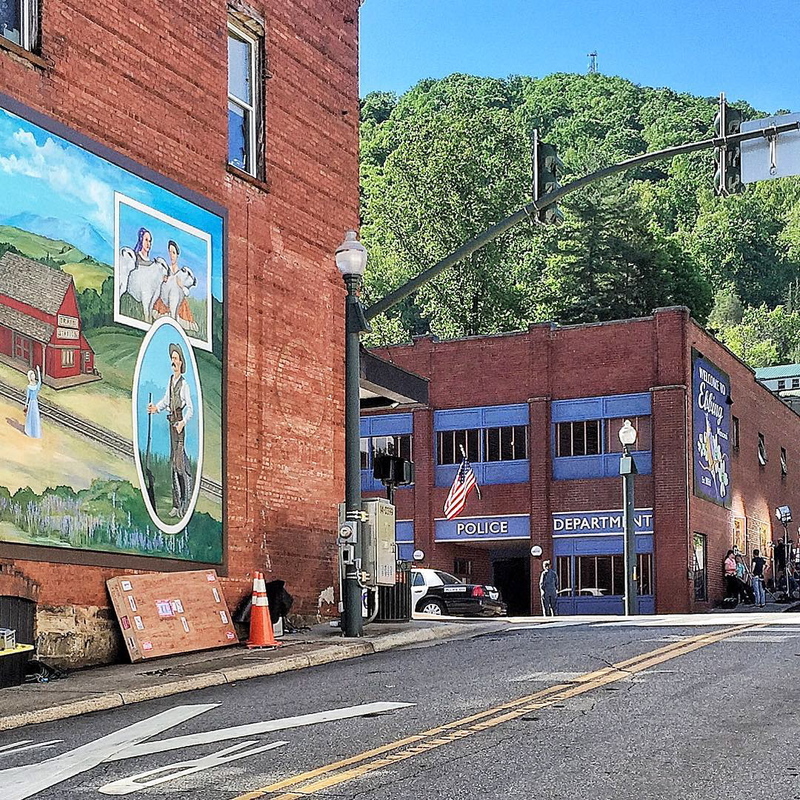 Ride the scenic Great Smoky Mountains Railroad in Dillsboro to see the legacy train wreckage from The Fugitive (1993), book an elevated resort stay in Cashiers where the Dirty Dancing remake (2017) was filmed or stroll the living set of Three Billboards in downtown Sylva. Discover why movie scouts have fallen in love with Jackson County. We think you will too.